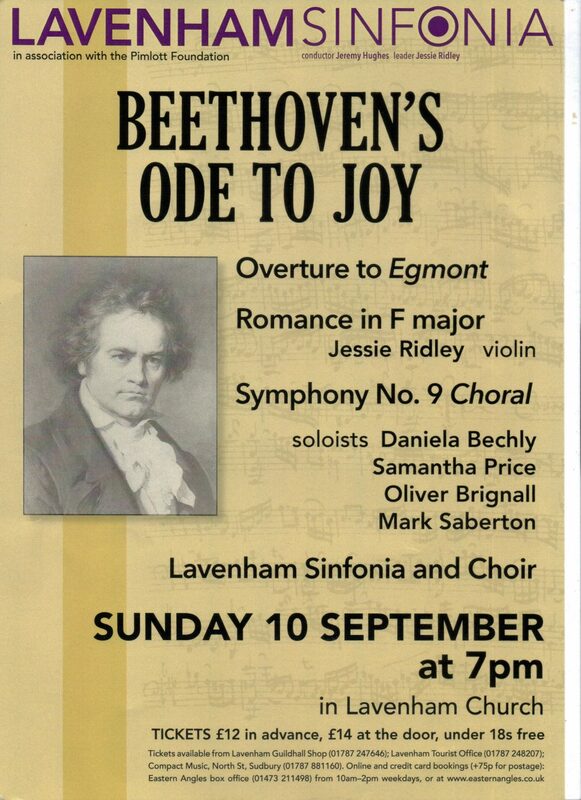 The final concert of our 2017 season is an all-Beethoven concert with a rare opportunity to hear a live performance of Beethoven’s Choral Symphony; it is also the final concert of Jessie Ridley as leader of the Lavenham Sinfonia. To mark this occasion, she will play the Op. 50 Romance for violin and orchestra. Beethoven’s Opferlied (A Song of Offering), for soprano, chorus and orchestra, is a rarely heard ceremonial work dating from the same years as the Ninth Symphony. This concert is a joint venture with the Pimlott Foundation, bringing together choir, orchestra and soloists in Beethoven’s grand paean to the joy of the human spirit. For more information please visit the Lavenham Sinfonia website here.